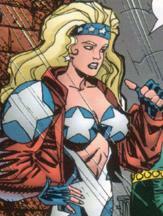 Liberty created by Erik Larsen, with help from Tom & Mary Bierbaum, Keith Giffen, and Dave Johnson. The veteran hero SuperPatriot began traveling across the United States, campaigning against the Vietnam War. It was on this mission that he met one of his many conquests, Rebecca Farrell, through her older brother Jake’s FBI contacts. Unbeknownst to the hero, he fathered two children who were named Liberty & Justice as homage to their father. During the Martian invasion of Earth, Liberty was abducted whilst on a mission with Justice and the Deadly Duo. She became the subject of a cross-breeding experiment that involved multiple rapes at the hands of the Martians. Upon her liberation, Liberty discovered that she was pregnant but due to her strong pro-life stance, she refused to have this hybrid child aborted and carried him to term, naming her son Damien. Damien soon became known by the moniker of Damien DarkLord and proved to be a major threat to the globe. He brain-washed his mother and many of other heroes into becoming loyal servants as he then took control of the Covenant of the Sword. When the Covenant was defeated, all of Damien’s slaves were freed.